Its time we embraced modern technology and use it to get the word out about music and its effects on our daily lives. Many years ago we used the newspaper to make announcements such as sales, special events, etc. but, as things have begun to change it has become important that we reach out in different ways to let people know whats going on in our stores, concert halls, venues, etc. I have such a love and passion about pianos and the piano business that I must use everything at my disposal to get the word out about our industry. In the coming weeks I am going to discuss some history of the piano and how music evolved but in the meantime, I want us all to reflect on what “has been” but then REALLY focus on “what will be”. We all get sentimental about the way things used to be. Maybe we enjoyed a concert or recital, a play or performance of some kind. Perhaps we were moved by a particular artist or student. None of this would have been possible without music and a musician. Social media has bought us an opportunity to bring more performers and artists to the main stage and in some cases even made them famous. This is something that could have not been done by a newspaper. Today I am watching CNN and its coverage of the disturbance in Cairo. The upheaval was reportedly caused by people blogging and posting on Facebook and Twitter. Amazing, that such a simple venue like Facebook and Twitter could be so powerful that it would actually help organize an international protest like the one in Egypt today. A powerful tool that is at the very least very cheap or in most cases free. Amazing that we can communicate to millions with our own computers. Amazing that we can “get the word out” as quickly and efficiently as we are capable of, but, THE MOST AMAZING OF ALL-WE ARENT TAKING ADVANTAGE OF THIS MEDIA. I am hoping that some of the following posts will bring this full circle and we can combine some music education and love for various instruments to “get the word out” that music is important. As many of you know who follow us on a regular basis, PianoSD closed in July. My biggest problem is that I REALLY love the piano and music industry. I have a real passion for teachers and music education and I dearly love the instrument itself. The history of the piano is rich and it seems that I can’t just walk away and not be involved in the industry. While I built PianoSD, one of the things that I did there on a regular basis was to post to social media accounts and blog posts almost every day. So, I began to offer to friends in the music industry to allow me to do their posting and blogs. The demand is big right now for social media connections and people really want to know what you are doing. Social media and blogs are the easiest way for people to keep up with you. The problem for a lot of music and piano dealers as well as teachers and artists is to take or have the time to do this. Although its not difficult it is a little time consuming. Max Morgan of www.MaxMorganDesign.com and I will be redesigning the website www.PianoSD.com to reflect our new direction soon. In the meantime I wanted to let everyone know what is going on. 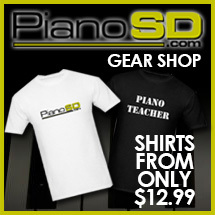 PianoSD is NO LONGER a showroom for pianos. We simply are a referral service for people in need. Last week I referred almost a dozen people customers to various services from tuners, technicians, teachers, violins and pianos. I have really enjoyed being able to do this because I keep up with what is going on in Southern California with the people in our industry. I wanted to tell you who we are working with so you can visit thier websites and see what they are doing too. and about 4 more on the way. We are negotiating now with two international manufacturers, 6 artists and two dealerships. What all this means is that even though I am not in the business of selling pianos, I am actively involved in the music industry and would be happy to help you if you are looking for a qualified tuner/tech, teacher, artist or if you are looking for a referral for a piano in San Diego, or a piano in La Jolla, or a piano in Carlsbad, even if you are looking for violins or orchestral stringed instruments, I can direct you and if you want me to go with you I would be glad to. Just to address money. I do not have a prearranged agreement with any of the dealers. I am friends with every one of them but, have no reason to suggest one over the other. If you want me to visit with you, I would request that you be respectful of my situation and pay me for my time and expertise which we can discuss at the time. Keep your eyes on us and watch as we begin to change the way we have traditionally done business. I hope you are happy with what you find.